Breast cancer is one of the most common cancers among women globally. According to the population based national cancer registry (India),  it is one of the major cancers in Indian females. As breast cancer is an epithelial malignancy, the prognosis of breast cancer is related to the number and types of oncogenes activated in the epithelial cells. Various hormonal markers, such as ER, PR and Her2 neu are routinely used to study this oncogene expression or amplification in breast cancer epithelial cells. However, stroma plays a key role in modulating tumor invasion and metastasis. A better understanding of stromal contribution to cancer progression will identify specific signals that promote growth, dedifferentiation, invasion, and ectopic survival of tumor cells and may eventually result in the identification of new therapeutic targets for future treatment. Stromal markers are now emerging as novel markers in assessing the prognosis of invasive breast cancer and have not been studied extensively till date. This justifies the current study of new stromal marker CD10 for prognostification and possible therapeutic intervention in invasive breast carcinoma. A total of 70 cases of breast carcinoma were studied, including 69 cases of radical mastectomy and 1 case of trucut biopsy. Relevant history, like age of patient, menopausal status, prior chemotherapy was taken. Ratio of positive to total lymph nodes dissected (LNR) was calculated in 57 cases. LNR was not calculated if total number of dissected lymph nodes were less than six. Staging was attempted in 69 cases based on the pTNM status of the breast carcinomas. 3 μ sections were taken on poly-L-Lysine coated slides. Sections were deparaffinized in xylene followed by hydration in descending ethanol grades. Antigen retrieval was performed by heating sections at 95 °c (3 cycles of 5 min each for Her2 neu and CD10) in citrate buffer (pH 6.0 for Her2neu) and Tris-EDTA buffer (pH 9.0 for CD10) and at 100 °c (2 cycles, 1st for 15 min and 2nd for 7 min for ER and PR) in citrate buffer (pH 2.5 for ER, PR) using an EZ antigen retriever system (BioGenex, USA). Sections were then incubated with power block (BioGenex, USA) for 10 min to reduce the non-specific antibody binding followed by incubation at 4 °C with primary antibodies for 1 h. Rabbit monoclonal antibody against human ER (Dako Anti-human ERα (EP1-clone)(Ready to use-RTU), mouse monoclonal antibody against human PgR (Dako Anti-human PgR Receptor (PgR 636-clone)(RTU), Rabbit monoclonal antibody against human Her2 (BioGenex Anti-ErbB 2/Her2(EP1045Y) (RTU) and mouse monoclonal antibody against human CD10 (Dako AntiHuman CD10 (56C6clone)(RTU) were used. After three washes with TBS, secondary antibody was added for 30 min. After three washes with TBS(trisphosphate buffer solution), 3,3'-diaminobenzidine substrate (DAB tetrahydrochloride) was applied to the sections for 10 min and sections were counterstained with hematoxylin, dehydrated with ethanol and xylene and mounted permanently with DPX. Negative control sections were processed by omitting primary antibody. Positive controls were (1) fibroadenoma for ER, PR (2) Previously known positive cases of Her2 neu positive breast cancer for Her2neu (3) Periductal stromal cells in fibroadenoma for CD10. Reporting of ER, PR and Her2neu was done according to the CAP protocols. CD10 was considered positive if more than 10% of stromal cells showed cytoplasmic and membranous positivity [Figure 1]. Statistical analysis was performed by using Graph Pad software (Prism 6 version) for Windows 7. Chi-square test was carried out to see the correlation between CD10 expression and different prognostic parameters of breast cancer. A P-value <0.05 was considered as statistically significant. A total of 70 cases of breast carcinoma were included in the study. Correlation between stromal CD10 expression and clinicopathological data of the cases is shown in [Table 1]. Stromal CD10 positivity was found to have statistically significant trend with increasing grade of tumor (P = 0.04), increasing mitotic rate (P = 0.33) and with worsening prognosis (P = 0.01). CD10 positivity was also significantly associated with ER negativity (P = 0.0001) and Her2neu positivity (P = 0.1902). No correlation was found between CD10 overexpression and PR staining of tumor cells. Also, CD10 immunostaining had a significant association with the molecular subtypes (P = 0.0004) of breast cancer, with CD10 positivity having a strong association with the HER2 subtype, and CD10 negativity with the Luminal subtype. However, CD10 positivity was found more in the triple negative group, no significant difference was found from the non-triple negative breast cancer. Age, menopausal status, tumor size, lymph node positivity (including LNR), tumor stage did not have any correlation with CD10 positivity. The findings of the present study correlated with the studies of Makretsov et al.,  Iwaya et al.,  Thomas et al. [Table 2]. In breast carcinoma, CD10 expression has apparently contradictory findings. 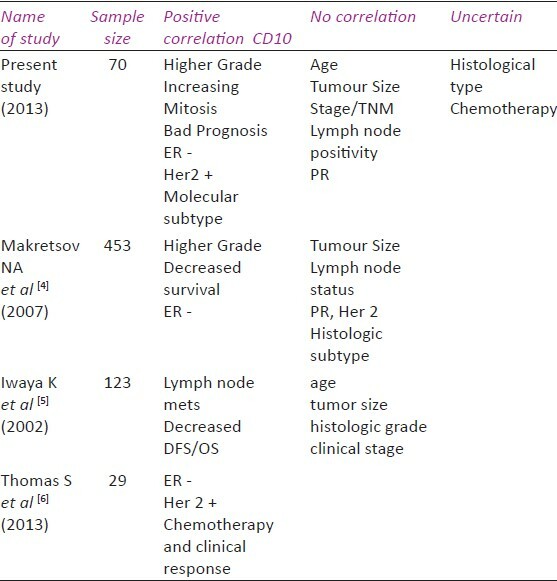 On one hand its disappearance from myoepithelial cells and the basement membrane leads to the progression of DCIS to invasive carcinoma and on the other hand, CD10 expression by the stromal cells surrounding the breast tumor is correlated with poor prognosis, oestrogen receptor negativity, and high grade. ,,, This can be explained on the model proposed by Maguer-Satta et al.,  [Figure 2], that an early oncogenic events in stem cells modulate the expression of CD10-enzyme in the altered cells or even in the neighboring cellular environment. A resultant decrease in CD10-enzymatic function after the neoplastic transformation of early common progenitors (ECP) or progenitors (P) could induce an accumulation of unprocessed peptides in the SC (stem cell) microenvironment, resulting in their lineage commitment and malignant proliferation. This is the proposed basis for progression of DCIS into invasive malignancy with CD10 loss [Figure 2]a. 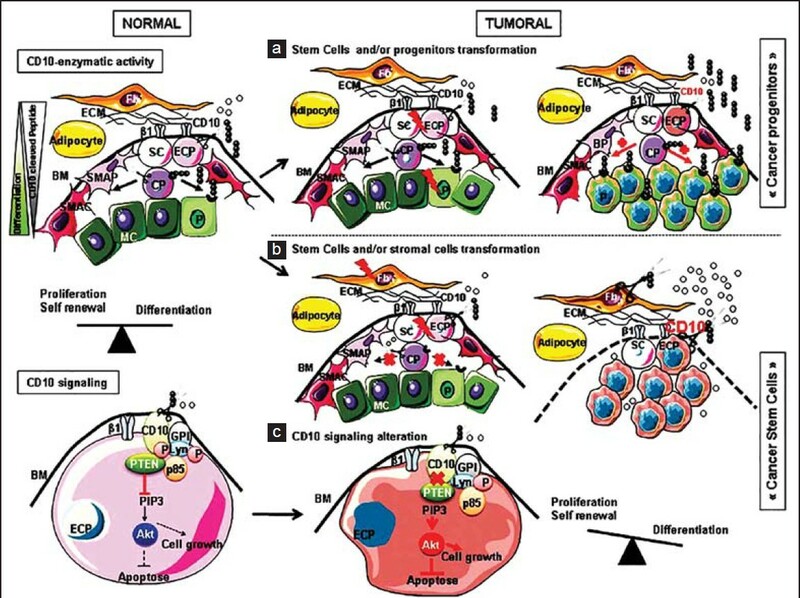 However, in invasive breast carcinoma, an upregulation of CD10 (mutated) enzymatic activity (mostly from mesenchymal SCs/or from proliferation of transformed epithelial cancer SCs expressing CD10) could lead to an accumulation of local CD10-cleaved peptides that inhibit epithelial cell differentiation and maintain cancer SCs  [Figure 2]b. This explains the increased expression of CD10 in undifferentiated carcinomas (i.e., with high histological grade and subsequently higher NPI) in our study. Explaining the association between CD10 positivity and hormonal status of breast cancer is much more difficult. 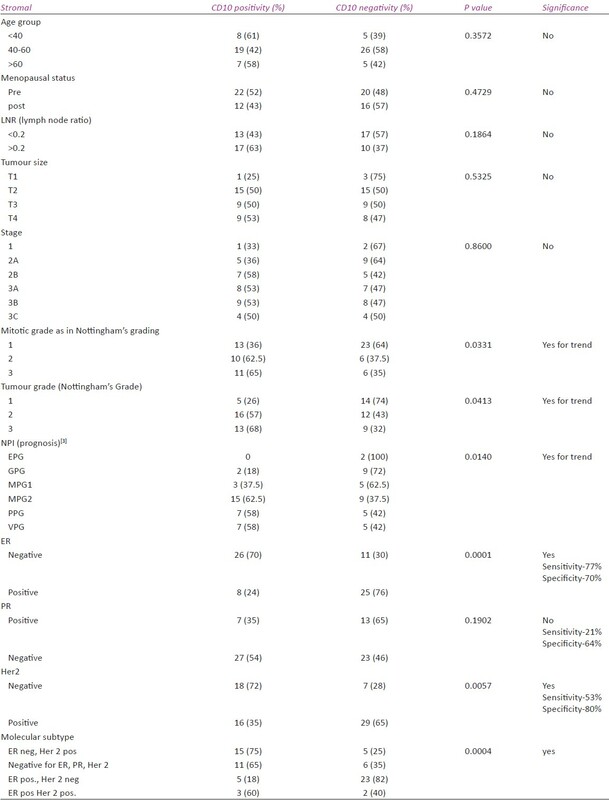 Most studies [Table 2] (including ours) have shown that CD10 positivity to be associated with ER negativity and Her2 positivity. In our study, CD10 positivity was associated with the HER2 subtype while negativity with luminal subtypes. Molecular studies have shown that in human breast cancer, basal like (ER-/PR-/Her2-) and HER2E(ER+/HER2+) subtype are more associated with PTEN loss, than luminal type (ER+). CD10 positivity in basal and HER2E subtype can be explained by assuming that in spite of high CD10 expression, defective signaling by CD10 in cancer cells leads to defective PTEN function, causing cancer progression and angiogenesis. Also, the initial oncogenic events in progenitor cells that cause PTEN loss may upregulate CD10 function in mesenchymal stem cells, leading to accumulation of CD10 cleaved peptides that prevent epithelial differentiation. That both CD10 positivity and PTEN loss are found more in the basal and HER2 subtype and absent in luminal subtype raises the suspicion that there is some relation between CD10 and PTEN in causing breast cancer. However further research is required to see the exact role played by CD10 and PTEN in breast carcinoma and their influence on the hormonal signature of tumor cells. A recent gene expression profiling study of breast carcinoma stroma identified two clinically significant types of stromal signatures in breast cancer, namely, solitary fibrous tumor (SFT) type and desmoid type fibromatosis (DTF) type, where the first was associated with poor outcome. CD10 expression was associated preferentially with desmoid-type fibromatosis stromal signature, and, possibly, contributed to a number of negative outcomes in invasive carcinoma of the breast with this type of stromal signatures. Further studies have shown that, CD10 positive stroma signature includes, among others, genes involved in matrix remodeling (MMP11, MMP13, and COL10A1) and genes related to osteoblast differentiation (periostin). This stromal signature is present in DCIS but absent in invasive carcinoma-proving the fact that progression from in situ to invasive breast cancer is dependent upon the tumor microenvironment. CD10 positive stromal signature also carried prognostic value in the HER2 positive breast cancer, and is associated with a poor response to therapy. A possible explanation, offered by Desmedt et al. and Cabioglu et al. is that positive stromal expression of CD10 is associated with increased expression of CXCL12 which causes transactivation of Her2, leading to increased levels of Her2. , Our study also showed a significant correlation between CD10 positivity and Her2 overexpression. However, the exact tumor-epithelium interactions explaining the specific clinical relevance of the stroma in HER2 Positive breast cancer is still a mystery and needs further research. All these points to the fact that stroma plays an important role in breast cancer progression and prognostification, and in coming days new markers such as CD10, TGF-β, SPARC, integrins and laminins are to be used for better prognostification of breast cancer. However, CD10 did not have any correlation with tumor stage (and its components-size, nodal involvement), but had a significant correlation with tumor grade (and its components-mitosis) and prognosis (NPI). This points to the fact that both tumor stage and grade are independent prognostic parameters. Another important role of CD10 immunostating is its role in drug designing. Treatment of breast cancer no longer depends on designing drugs against the cancer epithelial cells, but drugs that can have better delivery system, with maximum efficacy, least toxicity and that can modify the tumor microenvironment/stroma. This has led to development of peptide prodrugs cleavable by peptidases present in the tumor environment, thus increasing maximum efficacy with least toxicity. CD10, being a cell surface metalloprotease expressed in breast cancer, is capable of cleaving CPI-0004Na and related peptide prodrugs, such as N-succinyl- alanyl-L-isoleucyl-L-alanyl-Lleucyl-Dox (sAIAL-Dox). This proteolytic cleavage generates leucyl-Dox, which is capable of entering cells and generating intracellular Dox, with a higher potency than Dox alone. Cytotoxicity of CPI-0004Na is inhibited by phosphoramidon, a known inhibitor of CD10 enzymatic activity. Therefore routine staining of CD10 will be helpful in deciding the line of treatment of patients, especially in Triple negative breast cancer. To conclude, stroma plays an important role in development, progression, hormonal expression and response to chemotherapy in breast cancer. This has necessitated for the study of stromal markers in breast cancer. CD10, a novel stromal marker plays an important role in normal breast involution and in the development and progression of breast carcinoma. Stromal expression of CD10 in breast cancer correlates with poor tumor grade, bad prognosis, ER negativity and Her2 positivity, besides acting as a potential target for newer drug development. Further studies are required to see the correlation between stroma and hormonal expression in breast cancer, and the usefulness of CD10 to predict treatment failure in breast carcinomas receiving neoadjuvant therapy. ICMR [Internet]: Two- year report of the population based cancer registries,1999-2000, National cancer registry program me. Available from: http://www.icmr.nic.in/ncrp/1999-00/PBCR%20Report%201999_00.pdf [Last accessed on 2013 Nov 15]. College of American pathologists[certified]: Protocol for the Examination of Specimens From Patients With Invasive Carcinoma of the Breast [Protocol web posting date: June 2012]. Available from: http://www.cap.org/apps/cap.portal-144 [Last accessed in 2013 Aug]. Blamey RW, Ellis IO, Pinder SE, Lee AH, Macmillan RD, Morgan DA, et al. Survival of invasive breast cancer according to the Nottingham Prognostic Index in cases diagnosed in 1990-1999. Eur J Cancer 2007;43:1548-55. Makretsov NA, Hayes M, Carter BA, Dabiri S, Gilks CB, Huntsman DG. Stromal CD10 expression in invasive breast carcinoma correlates with poor prognosis, estrogen receptor negativity, and high grade. Mod Pathol 2007;20:84-9. Thomas S, Babu RJ, Agarwal K, Puri V, Jain M, Andley M, et al. Effect of neoadjuvant chemotherapy on stromal CD10 antigens in breast cancer - a preliminary study. Indian J Cancer 2013;50:46-51. Mott JD, Werb Z. Regulation of matrix biology by matrix metalloproteinases. Curr Opin Cell Biol 2004;16:558-64. Bremnes RM, Dønnem T, Al-Saad S, Al-Shibli K, Andersen S, Sirera R, et al. The role of tumor stroma in cancer progression and prognosis: Emphasis on carcinoma-associated fibroblasts and non-small cell lung cancer. J Thorac Oncol 2011;6:209-17. Pollard JW. Tumour-educated macrophages promote tumour progression and metastasis. Nat Rev Cancer 2004;4:71-8. Jinga DC, Blidaru A, Condrea I, Ardeleanu C, Dragomir C, Szegli G, et al. MMP-9 and MMP-2 gelatinases and TIMP-1 and TIMP-2 inhibitors in breast cancer: Correlations with prognostic factors. J Cell Mol Med 2006;10:499-510. Kass L, Erler JT, Dembo M, Weaver VM. Mammary epithelial cell: Influence of extracellular matrix composition and organization during development and tumorigenesis. Int J Biochem Cell Biol 2007;39:1987-94. Maguer-Satta V, Besançon R, Bachelard-Cascales E. Concise review: Neutral endopeptidase (CD10): A multifaceted environment actor in stem cells, physiological mechanisms, and cancer. Stem Cells 2011;29:389-96. Bachelard-Cascales E, Chapellier M, Delay E, Pochon G, Voeltzel T, Puisieux A, et al. The CD10 enzyme is a key player to identify and regulate human mammary stem cells. Stem Cells 2010;28:1081-8. Weil M, Itin A, Keshet E. A role for mesenchyme-derived tachykinins in tooth and mammary gland morphogenesis. Development 1995; 121:2419-28. Kenny AJ, O'Hare MJ, Gusterson BA. Cell-surface peptidases as modulators of growth and differentiation. Lancet 1989;2:785-7. Smollich M, Gotte M, Yip GW, Yong ES, Kersting C, Fischgräbe J, et al. On the role of endothelin-converting enzyme-1 (ECE-1) and neprilysin in human breast cancer. Breast Cancer Res Treat 2007;106:361-9. Kesse-Adu R, Shousha S. Myoepithelial markers are expressed in at least 29% of oestrogen receptor negative invasive breast carcinoma. Mod Pathol 2004;17:646-52. Sumitomo M, Shen R, Nanus DM. Involvement of neutral endopeptidase in neoplastic progression. Biochim Biophys Acta 2005;1751:52-9. Ganju RK, Shpektor RG, Brenner DG, Shipp MA. CD10/neutral endopeptidase 24.11 is phosphorylated by casein kinase II and coassociates with other phosphoproteins including the lyn src-related kinase. Blood 1996;88:4159-65. Zheng R, Iwase A, Shen R, Goodman OB Jr, Sugimoto N, Takuwa Y, et al. Neuropeptide-stimulated cell migration in prostate cancer cells is mediated by RhoA kinase signalling and inhibited by neutral endopeptidase. Oncogene 2006;25:5942-52. Goodman OB Jr, Febbraio M, Simantov R, Zheng R, Shen R, Silverstein RL, et al. 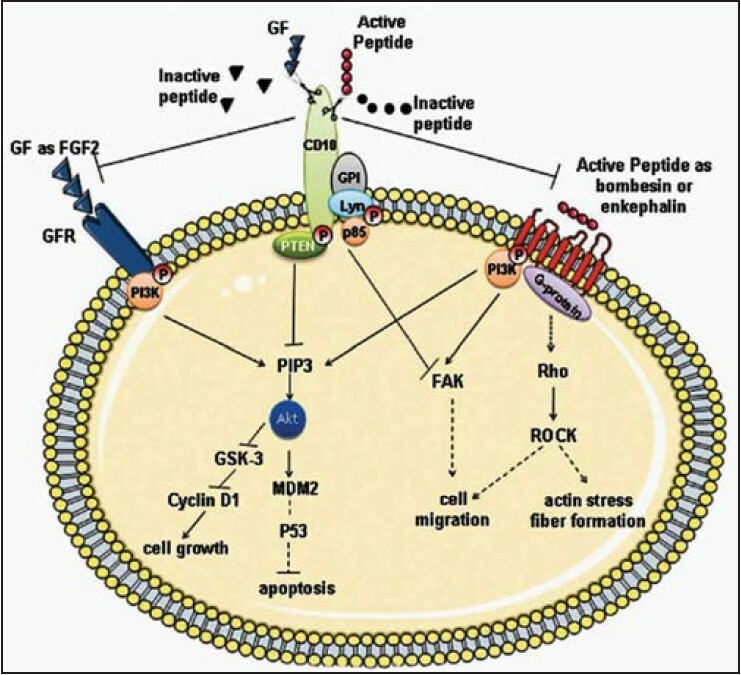 Neprilysin inhibits angiogenesis via proteolysis of fibroblast growth factor-2. J Biol Chem 2006;281:33597-605. Iwase A, Shen R, Navarro D, Nanus DM. Direct binding of neutral endopeptidase24.11 to ezrin/radixin/moesin (ERM) proteins competes with the interaction of CD44 with ERM proteins. J Biol Chem 2004;279:11898-905. Cancer Genome Atlas Network. Comprehensive molecular portraits of human breast tumours. Nature 2012;490:61-70. West RB, Nuyten DS, Subramanian S, Nielsen TO, Corless CL, Rubin BP, et al. 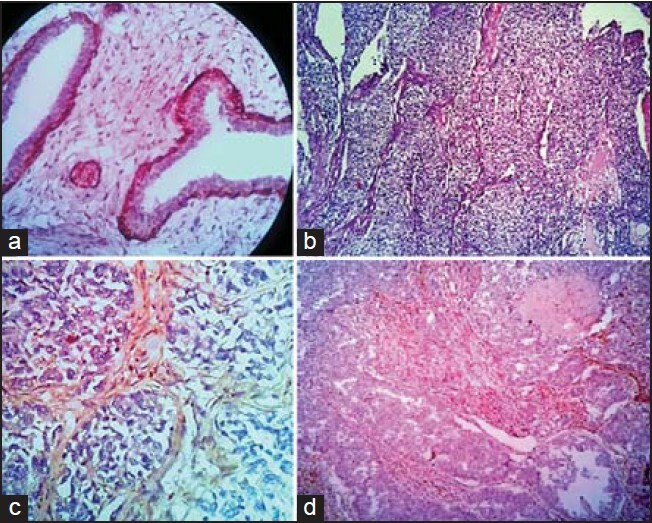 Determination of stromal signatures in breast carcinoma. PLoS Biol 2005;3:e187. Desmedt C, Majjaj S, Kheddoumi N, Singhal SK, Haibe-Kains B, El Ouriaghli F, et al. Characterization and clinical evaluation of CD10+ stroma cells in the breast cancer microenvironment. Clin Cancer Res 2012;18:1004-14. Cabioglu N, Summy J, Miller C, Parikh NU, Sahin AA, Tuzlali S, et al. CXCL-12/stromal cell-derived factor-1alpha transactivates HER2-neu in breast cancer cells by a novel pathway involving Src kinase activation. Cancer Res 2005;65:6493-7. Pan C, Cardarelli PM, Nieder MH, Pickford LB, Gangwar S, King DJ, et al. CD10 is a key enzyme involved in the activation of tumor-activated peptide prodrug CPI-0004Na and novel analogues: Implications for the design of novel peptide prodrugs for the therapy of CD10+ tumors. Cancer Res 2003;63:5526-31.